I just found out that I have a physical abnormality, aside from my short arms, bendable/shapable nose, and eyebrows that would grow all the way down to my eyelids if they had their way. I apparently have hitchhiker's thumbs. I was reading a post over at Pet Cobra's, and he mentioned it, so I googled it, and voilà! I'm abnormal. 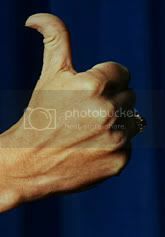 I was actually living under the misconception that the average human being had thumbs that bent backward like mine, and, because of that, I thought all the people with non-bendy type thumbs were deficient in some way. Armed with this new information, I still do. I have greater manual dexterity than you do. My thumbs, they be stylin'. My physical superiority proves itself daily. How does your physical superiority express itself?